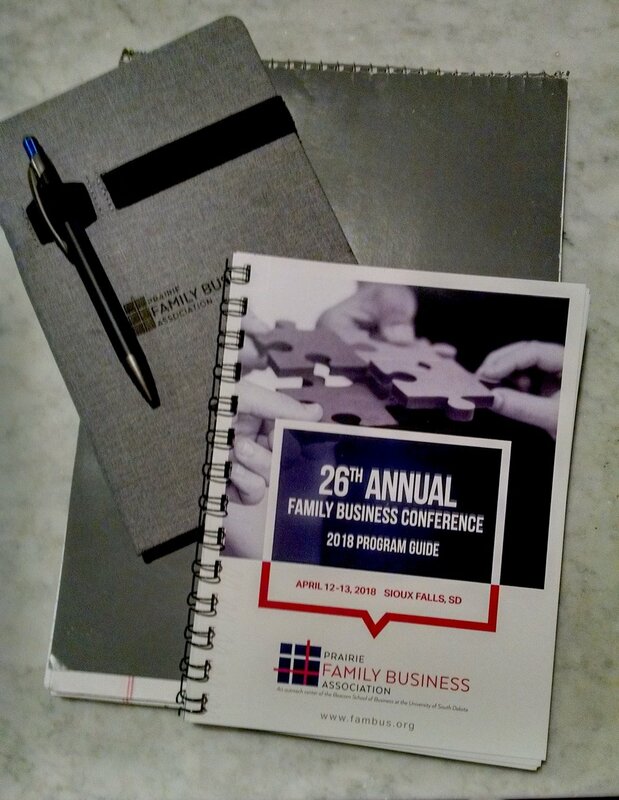 I should be attending day two of the Prairie Family Business Association's Annual Conference. Unfortunately, pending blizzard conditions prompted an early exit from the PFBA Conference finishing today in Sioux Falls, South Dakota. But, I got to enjoy one day of the conference and I'll share a few quick take-aways . . .
Craig Culver talks about the history of Culver's Butterburgers and Custard. Stacey, following up on last year's presentation from Captain Mike Abrashoff's Keynote presentation on the turn around of the USS Benfold reminded us of the importance of "crew interviews"--empahasizing the importance of really getting to know employees and communication among family business families. She also talked about "after-action reviews" to try and get to the root of problems and fix them so they don't reoccur. Craig emphasized that at Culver's "the most important people are the team members." He noted that "guests" or customers are also important but prioritized the importance of the organizational culture. Part of the success, according to Craig, for Culver is "getting the right people" and they have a significant screening process and 17 weeks of training for new franchise owners. Presenting on family business research findings from surveying PFBA members, the University of South Dakota (USD) researchers noted that 60% have some type of advisory board, consisting on average of 5 members with slightly more than half, 2.6, being family members. The boards meeting typically 2-4 times a year. They noted, cautioning that these were preliminary results on a small sample, that these boards were effective at resolving business issues but not effective at dealing with the family's issues. They noted that only 9.3% of the Family Businesses had a family council. Presenting on "No B.S. Family Business Planning, Rivers noted that their is a crucial difference between FBA's that operate as a "Family-Business" versus those who operate as a "Business-Family." He emphasized the need to prioritize the business aspects and by doing this well many family problems will be avoided. He also noted that the "Business-Families" do better on multiple business factors as well stating that BFA organizations return $6 of net worth as opposed to FBAs which, comparatively, return only $1. He highlighted the need for good business planning and focusing on people as two factors in success. Finally, he noted that a mission statement should be simple and no longer than one sentence. Dr. Anderson presented on Leadership & Next Generation Development. This break-out session was of interest because it was operating within the "wheel-house" of our own expertise here at HSC. However, being an informed consumer did not make me a great "recorder" of the points in this presentation. Thus, a caveat, I am not the average consumer of this material. With a Ph.D. in the same core area as Dr. Anderson, much of what was presented was already familiar . . . emotional intelligence, cortisol levels and the "fight or flight" response, trust and communication." The above statement is not intended as a criticism of the presentation, which was done well, and I am sure, was new information to those without my background. But the biggest take-aways here related to what we emphasize as human systems consultants . . . Psychological safety is critical to communication and trust. The best leaders have high emotional intelligence. Focusing on the Situation-Emotion-Response equals Result process. All-in-all it was a good presentation of the importance of Leaders developing good emotional intelligence as a critical factor for success. So that't the "quick takes" from the conference. I love attending this conference! It'a a great mix of service providers and family business owners. This year I got to meet and chat with a father-mother-daughter family, who run Triview Quality Communications. It is inspiring and informative to have these contacts. If you are a family business, or a provider to family businesses, in the midwest, I would encourage you to check out the PFBA! Family or Business? Ten Tips for Preserving the value of the family firm. Estranged family member? Tips for reclamation . . . or preventing family erosion.